Inside AdSense: Mobile Websites vs Responsive Design: What’s the right solution for your business? 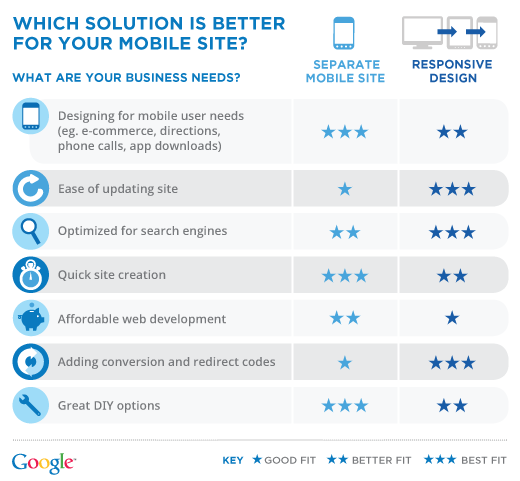 Mobile Websites vs Responsive Design: What’s the right solution for your business? As more of your competitors Go Mo, building a mobile-friendly site becomes more of a priority for your business. Over the past two years alone, mobile search traffic has increased five-fold. Customers are searching for your business from their mobile phones, and you need to engage them with a mobile experience designed for completing on-the-go tasks from their small screens. Recently many businesses have been asking us about an emerging trend among web developers—responsive design—and if they should use it. While we believe that building a separate mobile website is an appropriate solution for certain businesses, it’s also important to understand how responsive design might fit into your plans to Go Mo. What is responsive design? It is a website design technique that allows you to create a single website that will adapt to the device on which it’s being viewed, whether it’s a laptop, smartphone or tablet. A site built with responsive design will automatically resize for different devices, but it is up to you to prioritize the content that matters most to the mobile user. For example, a mobile user might need to quickly find your phone number or directions, whereas a tablet user might want a simpler way to make couch-surfing purchases. A site built using responsive design could prioritize click-to-call and click-to-map buttons, while the tablet site would focus on simplifying the shopping cart. For the technical details on how responsive design works for building mobile-friendly sites, read this blog post from the Google webmaster team. So how do I know if I should build a separate mobile website or use responsive design? If I decide responsive design is a better fit for my business, do I have to build my site from scratch? Not necessarily. A sophisticated web developer might be able to adapt an existing site with responsive design, but there will still be costs in terms of time and budget. Will a site built with responsive design have more than one URL? No. 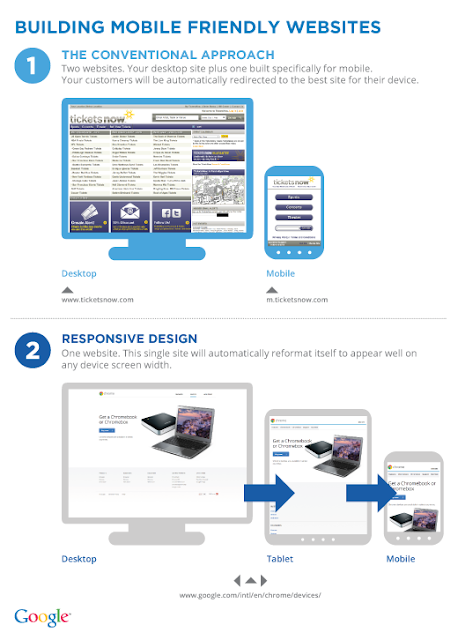 A site built with responsive design will have the same URL for desktop, mobile and tablets. When building a separate mobile optimized site, typically there is a different mobile URL, but the users will be taken there automatically as long as your desktop site is enabled with the auto redirect code. How much does it cost to use responsive design for mobile? Prices vary across developers and agencies. We recommend reaching out to a developer and/or agency for help on getting started. Responsive design can definitely minimize long term maintenance of your site, but many businesses can effectively connect with their customers with a separate mobile-friendly site. If you have the technical resources and a clear business need, then responsive design is a more advanced way to make your site mobile-friendly. No matter how you go about it, you need to ensure you are designing for mobile first, and engaging your customers when they're using their mobile phones to search for your business. For additional resources on the value of mobile, testing your site and finding developers to help you build your mobile-friendly site, visit howtogomo.com. The following post originally appeared on the Google Mobile Ads Blog.